How might we amplify student voices around the world? At a recent TED-Ed Weekend workshop, student attendees answered this question with a challenge: start as many TED-Ed Clubs as possible! And the TED-Ed Clubs Student Voice Challenge was born. 1. 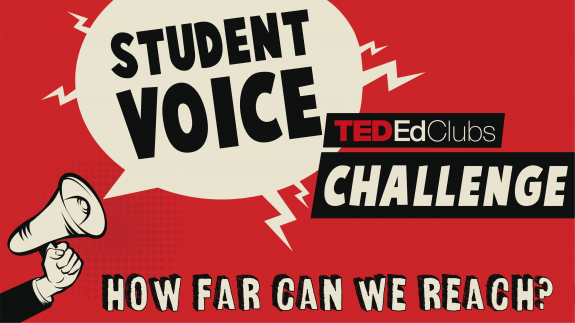 Tell us you are participating in the TED-Ed Clubs Student Voice Challenge by filling out this form. 2. Recruit as many people as you can who will organize students to share their voices in TED-Ed Clubs. 3. Send this link to whoever you recruit to join an orientation call about TED-Ed Clubs. The TED-Ed Clubs program supports students in discovering, exploring and presenting their big ideas in the form of short, TED-style talks. In TED-Ed Clubs, students work together to discuss and celebrate creative solutions to problems worth solving. Students also receive TED-Ed’s flexible public speaking curriculum to guide their club and to help inspire the next generation of leaders. To learn more about TED-Ed Clubs, go here: ed.ted.com/clubs.